Performing on concert stages throughout North America, Europe, and Israel, the award-winning Zamir Chorale of Boston awakens audiences to the exotic rhythms of the Middle East to the majestic anthems of 19th-century European synagogues, from the romances of Spain to the chants of Yemen, and from contemporary American jazz to the much-loved Yiddish tunes of Jewish musical theater. Founded in 1969, the Zamir Chorale of Boston is a musical and educational organization with a mission to raise awareness of the breadth and beauty of Jewish culture through performances, recordings, symposia, publications, and musical commissions. Led by Founder and Artistic Director Dr. Joshua Jacobson, the fifty member chorus performs music spanning hundreds of years, four continents, and nearly every musical style. Zamir’s repertoire includes Jewish liturgical pieces, major classical works, music of the Holocaust, new compositions, as well as Israeli, Yiddish, and Ladino folksongs. Concerts are designed to entertain, educate and inspire, which is why Zamir’s music is enjoyed by people of all ages, religions and races. Zamir’s devoted local following is exemplified by its special recognition by and support from the Commonwealth of Massachusetts. In addition, Zamir has a far-reaching fan base through its 25 recordings and tours throughout the US, as well as in Israel and Europe. Zamir’s documentary film, Jewish Voices Return to Poland, has been shown on public television stations across the US. In 2006, Zamir was honored to perform at the UN General Assembly for the first International Day to Commemorate Victims of the Holocaust. Zamir’s community involvement includes mentoring future leaders in Jewish choral music and collaborating with other choruses through joint performances. Joshua Jacobson, a world authority on choral music, served 45 years as Professor of Music and Director of Choral Activities at Northeastern University, including nine years as Music Department Chairman and six years as the Bernard Stotsky Professor of Jewish Cultural Studies. He is also Visiting Professor and Senior Consultant in the School of Jewish Music at Hebrew College, where he received an honorary doctorate degree. Dr. Jacobson is a sought-after scholar and lecturer. His many musical arrangements and compositions are performed worldwide. His book, Chanting the Hebrew Bible: The Art of Cantillation (Jewish Publication Society, 2002), is considered the definitive source in the field. Dr. Jacobson’s colorful programming and illuminating commentary make every Zamir performance a masterwork. Zamir Chorale of Boston is Choir-in-Residence at Hebrew College and a member of the Greater Boston Choral Consortium. Zamir is funded by the Massachusetts Cultural Council, Combined Jewish Philanthropies, the Commonwealth of Massachusetts and the generous support of its loyal supporters. Zamir Chorale of Boston is Choir-in-Residence at Hebrew College and is funded in part by the Massachusetts Cultural Council and supported by Combined Jewish Philanthropies. 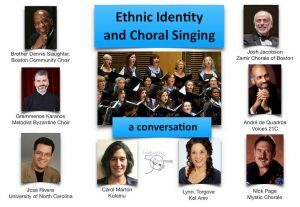 Zamir is a member of the Greater Boston Choral Consortium, a cooperative association of diverse choral groups in Boston and the surrounding areas.